Richard Richardson has been billfishing since he caught his first blue marlin in Kona, Hawaii in 1968. He has competed in over 200 billfish tournaments around the world and has caught over a dozen blue marlin weighing over 900 pounds; over two dozen blue marlin weighing over 800 pounds; and one blue marlin weighing over 1,000 pounds. 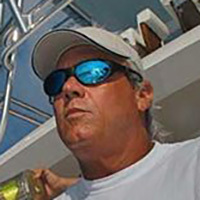 In 2004 Richardson received the IGFA's Gil Keech Heavy Tackle Award which celebrates outstanding catches on light tackle and innovations in fishing techniques and equipment.